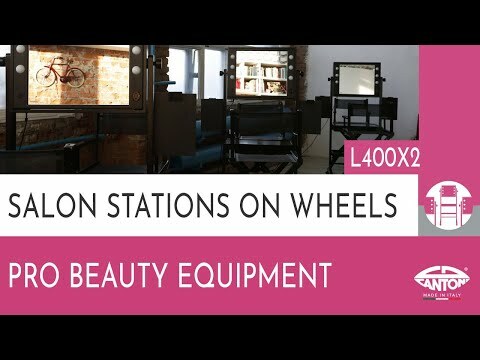 This movable makeup vanity table on wheels is the ultimate solution for beauty artists and makeup schools. Conceived for makeup artists and salons requiring wide support spaces, flexibility and perfect lighting. The mirror of this vanity table can be customized with your logo. Serving cart LCN in matching black plywood. No need to replace bulbs, neons or standard led light: we grant a minimum duration of 100.000 h/work: wWhat on first glance may appear to be bulbs, are actually lenses, made of a highly refractive, shatterproof material capable of diffusing and screening the light in a perfectly uniform manner. In order to clean this L400 vanity table from fingertips, you can use a simple wet sponge. To remove oil stain, makeup spot, do utilize cleansing cream or makeup remover. Do not utilize strong cleaner to avoid to damage the lacquer. PRINT OF YOUR LOGO: If you want the product you've chosen to be printed with your logo, select the appropriate option. After completing your order, please send us an email with attached the file for printing at cantonionline@cantonionline.com . It will be accepted only in vector format file traced in one path. The print output, by default, will be done in white color an placed in the upper centre of the mirror. This lighted vanity table is perfect for makeup schools, backstages for movie or tv sets. Perfect light for touch up as for long makeup works for special effects. Sturdy and handy, it is very stable and easy to move.